The EIA reported today that working gas in storage was down 152 Bcf last week to 1.196 Tcf. The withdrawal was in line with last year (-149 Bcf) but 45% greater than the five year average (-105 Bcf). The current storage level is 43.2% below last year (2.104 Tcf, a difference of 908 Bcf) and 38.8% below the five year average (1.954 Tcf, a difference of 758 Bcf). Temperatures in the Lower 48 last week averaged 36.9 degrees, in line with last year but 2.4 degrees cooler than average. 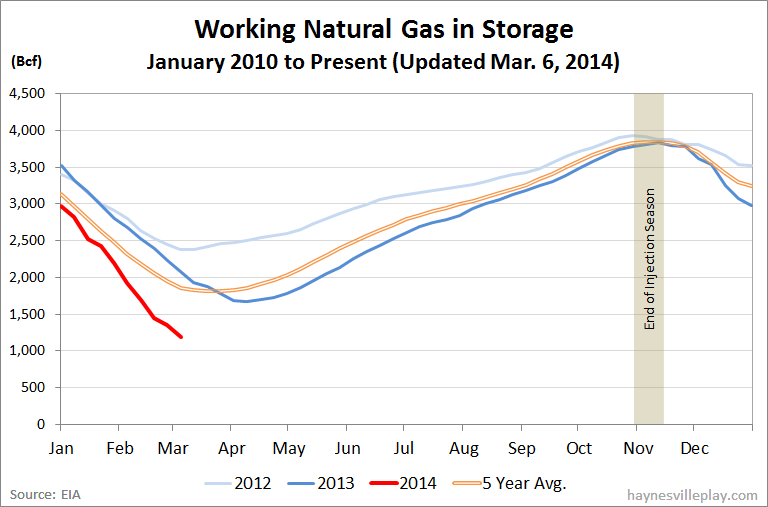 Gas in storage is about half the 2012 levels for the same point in February/March. We still have plenty of volatility in the gas industry.